Endeavor’s PackBot is used to disable roadside bombs, clear IEDs and other dangerous missions. Credit: Business Wire. 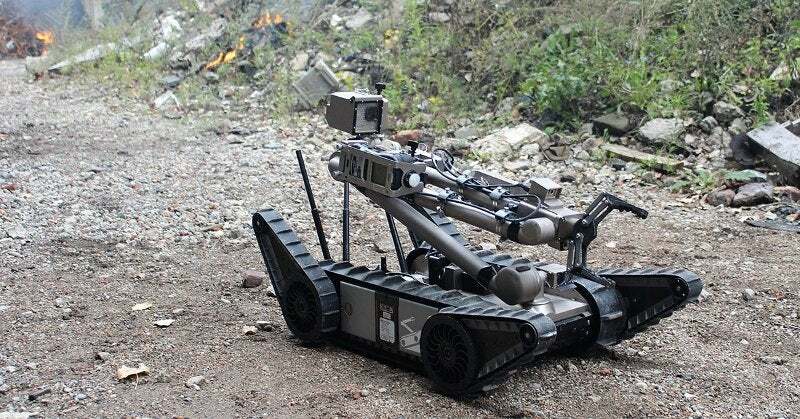 Endeavor Robotic is a provider of mission-critical unmanned ground vehicles (UGVs) to the US Department of Defense (DoD), global military, law enforcement, public safety, and critical infrastructure customers. The company’s family of UGVs includes 5lb throwable FirstLook reconnaissance robot, the small unmanned ground vehicle (SUGV) PackBot, and 500lb Kobra heavy-lift robot systems. The ground-based robots are deployed for explosive ordnance disposal, reconnaissance, inspection, and hazardous materials support. Formerly known as iRobot Defense & Security, Endeavor has delivered more than 7,000 UGVs to customers in over 55 countries to date. In 2017, the company was awarded the DoD’s Man Transportable Robotic System Increment II (MTRS Inc II) contract to build medium-weight, remotely operated, man-transportable robotic systems. The company unveiled the design details of its new multi-mission ‘back-packable’ UGV Scorpion. The latest deal follows the acquisition of Canada-based Aeryon Labs for $200m. Aeryon Labs develops high-performance unmanned aerial systems for government and commercial applications. FLIR Systems president and CEO Jim Cannon said: “The acquisition of Endeavor Robotics, coupled with previous acquisitions of Aeryon Labs and Prox Dynamics, has positioned FLIR as a leading unmanned solutions provider and advances the strategy we detailed at our investor day last year. The Endeavor transaction is expected to be completed in the first quarter of this year. Following the deal, Endeavor will operate as part of FLIR government and defence business unit’s unmanned systems and integrated solutions division.